Killer menswear in Andersonville. All at Notre. We’ve all got some traveling to do before year’s end. Holidays. Unused vacation days. Get-the-hell-somewhere-warmer days. But before you skedaddle, you’ll wanna hit Notre in Andersonville. They open today. Inside: A dark, modern aesthetic with first-class labels, all curated by the most friendly style savants you’ll ever meet. 1. Rogue Territory Jumper Shirt – Because chambray breaks into all kinds of comfortable. Handmade in L.A.
2. Steven Alan Double Pocket Shirt – Heavy duty wool shirt jacket. Practical, versatile, reliable. 3. Common Projects Sneakers – Minimalist leather sneakers by way of Italy. Molto bello. 4. Wings+Horns Westpoint Chino – Classic military-inspired chinos with an updated slim fit. 5. Mr. Gray Socks – It’s all about the details. 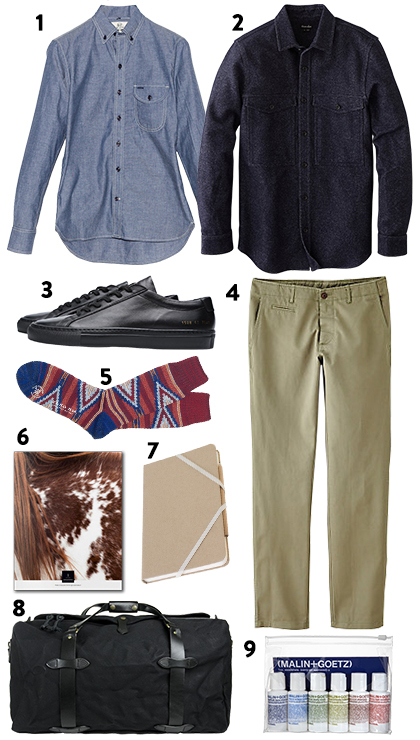 These Mr. Gray socks add a subtle pop of pattern to any outfit. 6. Collective Quarterly – Our favorite new travel glossy heads to Absaroka for its second issue. Will incite wanderlust. 7. Makr Notebook – From the leathersmiths at Makr, a useful travel accessory that never runs out of battery. 8. Filson Duffle Bag – Filson’s bags are built to last a lifetime. This medium duffle is sizable but small enough for the overhead. 9. Malin+Goetz Travel Kit – Everything you need to stay fresh on the road. And TSA-friendly.